Thompsons, formerly Thompsons Garage is a late night club that is open usually every night of the week. 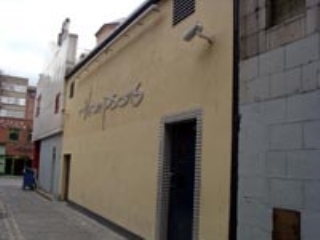 Thompsons is found right beside Belfast City Hall, up a narrow alleyway. By day you could miss it easily, but at night simply follow everyone else and you'll end up there. Check the website for the latest upcoming events. Have you got Google Earth on your computer? If so, then download the Google Earth view of Thompsons. Is this the wrong position for Thompsons? If you think so, then modify its position. Click / Tap the button above to get directions from where you are to Thompsons. Christ what a dump ! This has to one of the most dirty bars I've ever been in. def a place to avoid. Over priced and really scummy. In all honesty? i love thompson they should be proud of this club and anyone who works there should be proud lovely friendly people and staff hate clubs where the bouncers are prevvy and just let wee half nked tarts in but thompsons are very friendly, bouncers are fair and have a resonable policy i was drunk one night and they turned me away, fair play means i couldnt go get even more drunk and end up lost or something. THOMPSONS= Great music, Great staff, Cheap drinks, Great craic, easy to pull 3 Cheers for Thompsons!!!!!!!!!! i will admit the atmosphere is very lively- ALOT of good dancing. however, there are two toilets- two unisex toilets and when i was there on a wednesday night, the place was absolutely packed you could barely move so can you imagine the toilet que? there were alot of drunk people stumbleing round and falling everywhere. they didnt i.d much girls either- mainly the men who got asked for i.d. however, i lost my purse and somebody was nice enough to hand it in to the bar, and a nice bouncer came with me to look for it- nice staff. 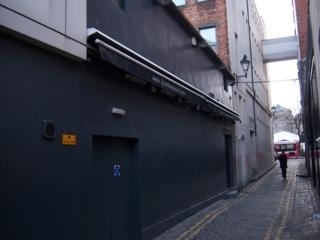 horrible spot, grimey little place with grimey little bouncers, cant even look at a fire extinguisher the wrong way r u'll be tossed out hate it, nearly as bad as rain and jaxx and the rest of belfasts horrible clubs. best club ive been in since the old kitchen night club in dublin.it capped off a great first night out in belfast. some serious talent in belfast. I <3 Thompsons. Music is the best in belfast! Alot of hot girls but some of them are old lyk. Pulled a 24 year old =/ Didnt obv no at the time. Was only 18 hahaa! Love it tho, the girls are gagging for it! To be honest I've only been once and absolutley loved it! belfast seriously lacks decent clubs that play proper club tunes (not crappy RnB or commercial rubbish) cmon what happened Belfast??? Belfast "used" to be a really lively town with lots of great clubs but now they've all been swapped for swanky lounges for pretentious wannabes! Thompsons has what the rest of Belfast hasn't (asides from rank toilets perhaps lol) but thats forgivable as you should spend most of the night on the dancefloor not in the bathroom!!! Had a great night here on Friday 3rd April. Fell in love with a bloke and I never even got his name or number and I was only over in Belfast for the 1 night. I think I am going to have to go back everyweekend so I can try and find him. This place is touch and go, not for the snobs thats for sure! Went for the first time not long ago really enjoyed it. Kool music and the bar staff were friendly also good doormen very helpful. some very nice girls who arnt afraid to come up and dance with you. BUT there is a few thugs that end up inside. other than that very good place! Thomos is the real late nite club- miles better than yello- friendly staff, treat them with respect and they'll do the same!! You got the toilets fixed...Bravo! And they are clean, love it. ur ma will be back son. went once and never again, vvvvvvvvv dodgy spot!!!!!!!! Been to Thompsons a few times, out of most of the places I've been I think this is one of the best. It is true what that other person was saying, 'You either hate it or love it'. The music differs from a range of Electronica, mainly House. The staff are quite friendly and the prices are fair enough to pay I think. The toilets have proved to be quite disgusting in the past, but for an after hours club its great. The only thing I can criticise is the place is full of whipe-outs and weirdos but if you dont annoy them they wont annoy you and you can have a swell time, the majority of the people are friendly especially the staff. I personally really like it because of the music played and I have had good times there. Thompsons only opens at 11 - head in then with a card for free and get a seat for a while, chill for a bit and have a laugh while the place fills out. The music's great, the staff do a good job and you're anyone's mate in there. The toilets are fairly grim, but it's a small price to pay for a good time. It's a tenner in, which is fair. But get a card and you're in free if you fancy it. It's one of those places you iether love or hate. But it's definately better than Yello! Oh, and dress code means no teddy sherman or desert boots. The bouncers weed out most of the spides and are a friendly bunch. Taz is great craic! Still my favourite club after going there for 5 years. Fab staff and always plenty of eye candy! Pretty middling place. Completely dead until 12 then packed out. Toilets are the worst I've ever come across in the entire world, tricky holding the door closed with your foot and reaching for the non existant loo roll. Also dance floor seemed to be flooded by the out of commission mens and ruined my shoes!!!! - Sort it out Thompsons!!! Sound system and smoke machine bit rough on the senses. If there were more places open late I'd say they'd be out of business. My advice, if you've a strong bladder and lungs, along with ear plugs and a pair of wellies you're sorted, Thompsons is the place for you!! If not you'll only have a good time if you're too drunk to care! Shame really, wouldn't take much to bring it up a step. I went to Thompsons for the first time ever and I will NEVER return!! ?10 entry to listen to a load of extra loud rubbish! My ears were ringing for days. The toilets are disgusting and the crowd was dodgy! NEVER AGAIN! Best club in belfast by far! ok the toilets are dodgy but the dj's make up for that by giving a bangin up-front performance that will never fail to impress! I also forgot to add. The men's toilets doesn't have a functioning washbasin. How disgusting is that? Basically every man who goes to the loo there all night long isn't washing their hands. If you don't want to catch a disease don't shake hands with anyone in there unless you have rubber gloves on. Yuk! Thompsons is a bit scuzzy really. The music policy is tired and never leads the way really. The resident dj is regularly billed as playing a "six hour set" but puts on a mix cd and sits in the pub next door until about 12 or so becuase the place is always completely deserted until this time. The place has dirty toilets with no loo roll and a huge queue even whe the club isn't busy. The sound system is well below par and will leave your ears rining for days, I can't believe i used to go to this place regularly. Probably becuase there isn't an awful lot happening in Belfast, though there are quite a few much better clubs than this place now no matter what music you like. Try Milk, Skye or the Stiff Kitten instead. love thompsons it is a great place 2 go music is great.